I’m a runner? Yes I am! I know, I know, I was going to post more often, and more about my fitness journey. I guess that, while that’s true, it still won’t be as often as I like. But today is a day for triumph and self-congratulation, and I plan to indulge in just that. Let me tell you a story. Yesterday was my first official 5K, and it totally rocked. My Achilles had been in such pain for a week. I barely made it through Monday’s final group run, even with walking quite a bit. A lot of RICE, including compression recovery socks, during the week had brought me back to about 90-95%, but I was still figuring that I needed to drop my expectations from a sub-40 minute finish to more like 45 minutes to keep from injuring myself. I got up tremendously early for me, got dressed, got my stuff ready to go, wished my son luck on his PSAT, which he was leaving for shortly after I left, and headed out the door. The drive up to Saratoga Spa State Park was beautiful. Lots of fall colors everywhere, with some pretty fog in some of the valleys (pretty because I didn’t have to drive through it). I got there early enough that I was able to get a good parking spot at the pavilion nearest the finish line pavilion. The finish line pavilion parking lot itself was reserved for (oddly enough) the finish line, as well as vehicles for the group coordinators. It was a beautiful, clear day, and was about 47 degrees by the time the race started, and about 55 at the finish. Once I arrived, I checked in at the No Boundaries tent and picked up my race packet. I got my bib on, made a first pit stop, and headed back to the tent to chat with teammates. I should mention that at the restrooms/portapotties, I was extremely happy to be a guy. There was a tremendous line of ladies waiting for both the portapotties and the ladies room in the pavilion, but the mens room was a walk-in. Our No Boundaries teams were ready, over 100 strong including coaches and mentors. Once we were all assembled, we took some group photos, got a pep talk, did our warmups, then moved into the start area. I was able to make another quick run to the restroom between the photos and the warmup. Once the race started, it took a while for the pack to make its way past the start line. I started RunKeeper as I approached the line and started off, trying to keep a steady pace that could go through the race. My Achilles was feeling much better, but still not 100%. We ran up the inventively-named North-South Road, turned on Roosevelt Drive, and headed to the quadrangle between the Spa Little Theater and the Hall of Springs. Lovely courtyard area, but no time to stop and take pictures. I had a race to run! We hit the half-mile mark partway into the quad, and things were holding up well. I started feeling a little wonky as we were making the turn at the far side, and decided that maybe I’d walk a bit once we hit the one-mile mark. On the way back to Roosevelt Drive, I came up alongside a guy that made me look small, and started to pass on the right, since that’s where the open space was. He had apparently decided that he was going to cut the corners close, and I ended up having to put my foot on the first step of the Hall of Springs as we rounded that corner. I had pulled even with him by the next corner, so it was a little tight on the corner but I was able to get past cleanly. As it turned out, the one-mile mark was as we got to the end of the quad and passed by a group of No Boundaries coaches and mentors, so I ran past them. After we turned a corner past some trees, I finally slowed to a walk and took a hit from my water bottle. At that point, I realized that in all of the excitement, I had forgotten to drop a Nuun tablet into my water, and I had plain water with no electrolytes to keep me going. Thankfully, it was nice and cool, so it kept sweating to a minimum. I walked for a little under a minute, until we went through the gates into the Saratoga Performing Arts Center. There were several people that I saw passing me, then I’d pass them, then we’d do it again. I kept thinking to myself that I’d do my best to keep my pace, and if they wanted to keep shifting gears, that was their problem. We ran past the SPAC amphitheater, and then out across the main entry/exit bridge, which always feels like a cattle chute after concerts. After we cleared the turnstile shelter, we circled the giant sundial in the entry plaza and headed along a path between the woods and the parking lot. We got to the secondary parking lot, circled a restroom building and some more woods, then started back along Geyser Loop Road. At the far end of the circle, at around the 1.5 mile mark, I started tiring again, and walked for another couple of minutes. I started wondering if I was going to need to stop every half-mile or if I could make it to the end. While I was walking, I ran into one of my teammates, who told me that another teammate was having some calf problems and had to shift to walking. We hoped that she’d be OK and that she would be able to run again before the end. As we were approaching Mile 2, I got ready to slow to a walk again, but then something magical occurred. As we rounded a turn in the road just before the two-mile mark, there was a major downhill. I thought “Woo-hoo! I can do this!” and ran down the hill, feeling good. When we got to the bottom of the hill, we needed to turn left into the woods. I remember thinking “OK, now here’s where we pay for that downhill.” And I was right. We went up over 80 feet in elevation in less than a quarter-mile. I don’t think that I saw anyone in sight that didn’t walk the whole hill. It wasn’t just a steep hill, it was on a rocky trail that had uncertain footing. I chatted with a teammate as we worked our way up the hill. This was the part of the course that was changed a week and a half ago because the park decided that they didn’t want us running through SPAC grounds on the way back, so they detoured us along Geyser Loop and the hill in the woods instead of going back the way we came. We crested the hill, hit the pavement at the end of Roosevelt Drive, and I started running again. I had a thought of walking again at 2.5 miles to save some energy for the finish, but the coaches and mentors were there again. I had to run past them. Once we passed them, we made the turn back onto North-South Road and headed for home. At this point, I said to myself “It doesn’t matter. This is the end, just run it in.” We ran down the road, and I noted when we passed the lot where my car was parked as a point of interest. We came down the home stretch, and the last coaches and mentors were there. I prepared to muster up everything that I had left for the finish. As I passed the start line, I told myself “Here we go!” and kicked it into gear. According to RunKeeper, I did the ~2/10 of a mile from that point to the finish at about an 8:12 pace. There was a woman running in front of me that I started catching up to. I kept telling myself “Here we go!” and started catching her. She heard me coming and started pulling back away. I told myself that it didn’t matter, because I wasn’t racing her. One of the mentors ran with me through the turn, gave me a little moral boost, and stopped to go back and help another teammate as I pumped furiously for home. 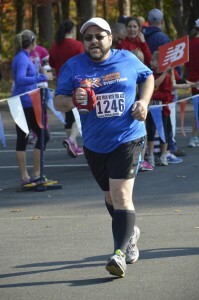 I watched the clock as I neared the finish line in the parking lot, and the clock was running through 42:12, 13, 14, 15. I ran through the finish line, stopped RunKeeper, and kept walking to the end of the chute. Between being winded, drained, and exhilarated, I was walking in a bit of a daze. I headed aimlessly back in the direction of our tent, draining the last from my water bottle. I looked at RunKeeper. It said that we’d only gone 3.05 miles (probably as a result of the late course change), and that my time was 40:07. 40:07! I refilled my water bottle, and someone told me that they were posting results back at the main pavilion as they came in. I walked over and worked my way through the crowd in front of the results sheets on the wall. I ended up having to have a teammate who was a few people in front of me check my time. Chip time 40:02! Official clock time 42:21. Part of me was bothered that I missed sub-40 by mere seconds. The rest of me was awed by the fact that I was that close at all. I turned, headed to the refreshment table for carbs, and found an opening in the people. There were Dunkin’ Donuts sticks that looked like either donut or bagel sticks. It turned out to be “french toast sticks,” which tasted horrible. after a couple of bites, I tossed it into a trash can and went back to the table. There was a massive fudge brownie calling my name. I grabbed it and happily munched on it while walking back to our tent. I took a closer look at my splits. Mile 1, 13:17. Mile 2, 13:25. Mile 3, 13:00. Fractional Mile 4, 8:12. Absolutely unbelievable. There was a lot of hugging, congratulating, and discussion of figuring out a way to run together through the winter. I finally headed home, thrilled with my experience. I decided to take some teammates up on their plan for lunch at a nearby restaurant, so when I got home I did a quick change (into my new jeans, 4 inches smaller than my old ones) and headed out to lunch. We had a great time, again discussed possible winter running, and who was going to do the No Boundaries program again in the spring. I looked at my finish stats online tonight. I finished #893 out of 1094, 28 out of 33 in my age group (45-49). I have no complaints. When I started down this path back in March, I couldn’t run for 10 seconds, and a 1.5 mile walk tired me out. I am now A Runner, and it will only get better from here. I still have quite a ways to go before I max out my speed and distance, especially since my weight will continue to drop (39.1 down so far, 59.2 left to go). The less I carry, the faster and farther I’ll go. This was such an awesome first-race experience, and I am so excited to continue this journey that I’ve set out on. I’m already figuring out how I’m going to get in another race before the local winter race shutdown, and trying to come up with new goals to set before my 50th birthday in the spring. Moral of the story: You will not succeed at 100% of the things you don’t try. Do it! Do it now! 2 Responses to I’m a runner? Yes I am! In my post, I really neglected to thank a lot of people who made that whole experience possible. All of the coaches and mentors with No Boundaries were tremendously helpful in getting from a little bit of running short distances to running most of the race. From guidance and encouragement to pushing us to try harder and go faster, they were there for us every week of the No Boundaries program. Special shout-outs to Coach Rosella and mentors Chuck and Jim. The staff of the No Boundaries program did a great job of running the program. Patti and Molly were great. The rest of the staff at Fleet Feet Sports Albany and from New Balance were so helpful and encouraging, and the helpful staff at Fleet Feet got me into the gear that I needed. And, of course, my No Boundaries teammates are completely awesome. Whether they were way ahead of me or (not so) far behind me, we were all working toward the same goal, and the spirit and encouragement of the group is wonderful. I’m looking forward to the spring program, though I’m going to try to continue to make the group runs that will be continuing informally through the winter. While I ran the race myself, this wasn’t a one-man show. We are a great team. I am so proud of you. Your journey is an inspiration because it is real and honest. Seeing you cross these milestones of health is wonderful. Last night I showed K your profile photo and then the picture of you with Ariel. She said ‘you can really see the difference!’ Indeed. Well done and kudos to all. In the past you have walked in the March of Dimes events to raise money for those who didn’t have a chance at life. These efforts are giving you a longer and healthier one. The combination is powerful.